Read short testimonials of faith from some of MCGI’s youngest brethren baptized on January 1, 2016 at the Ang Dating Daan Convention Center. This is where I felt the truth as compared to the other religious sects I’ve been in. In the latter, I felt that they were just deceiving me. It’s because their teachings are mostly just like advertising. Whereas here, the teachings are truly based in the verses of the Bible. That’s why I was encouraged to join. I had the opportunity to attend Bible Expositions despite being tired from work, I pursued going there because our souls need it right? So since I was given by God the opportunity, I am very happy this day. It’s the first day of 2016. It’s such a wonderful day for me. I know this sounds bad but I’ve been listening to Bro. Eli since 1982; I listened to his debates. His station was DZBB, on Don Manolo Favis’ program. Many were in opposition to him in that program, but compared with them, his biblical point of view is different. Bro. Eli is really remarkable. My only regret is that I’ve been hearing his statement of “Don’t delay [to do what is good upon hearing God’s words]” since then, and yet I tarried. So here I am now. I have finally gotten what I have long been desiring for in life: To be complete. Well, before I was baptized, I was actually feeling cold and feverish. But after I got immersed in water, I felt energized, especially as I was getting dressed. I wish him good health, because he has already lead many [unto the truth]. In fact, the volume of believers now is astounding as compared with before. Compared with other religious sects, we are many. If we will be able to reach [other nations], then the more we will be able to hear Bro. Eli’s preaching. Because if you are really analyzing [or concerned for] your spiritual state, this is it; you will find Bro. Eli’s teachings. They are really remarkable, him and Bro. Daniel. Of all the religions I’ve been to, this is where I saw the right teachings. Inexplicable. [Laughs] I couldn’t refrain from crying back there. My tears were really just flowing. Also, I feel relieved now. Actually, I haven’t had sleep as it was noisy last night, and we cooked as well. I prayed that He may give me strength. Until now I’m okay. Many thanks. Thanks them, because of their preaching, I became a member. Many, many thanks. I was abroad where I had a friend who is a member here in The Old Path [the Church of God International]. I then replied, “What kind is that?” She said, “You will see things in the Lord Jesus Christ. It’s called The Old Path [based on Jer. 6:16].” I told her that I will find it once I get back home. I actually only know her nickname. I call her “Nene” [little girl]. But I don’t know her real name as we just met once, during an emergency. I went to Bataan to spend my vacation at my sibling’s house. But going here wasn’t in my heart and mind then. Now, our neighbor is a member here, but she’s just been recently baptized. While she was talking with someone about their beliefs, I asked “What religion is that?” They said, “Ang Dating Daan” [The Old Path]. I instantly remembered what my friend said. Then I asked, “What kind is that? What kind of teachings are taught there? Who is being worshipped there? Is it like the Jehovah’s Witnesses?” At the time, there were still Jehovah’s Witnesses that went to my house and I entertained them. Finally, I asked them, “Can I go with you?” Sis. Kristina replied, “Sure, you can come with us.” It was a Thursday then, and I was told that at around 7 pm there was a service. If you want we can just listen. I actually didn’t have any formal dress then. I just had pants and a shirt. I had only two pairs of clothing as I was just on vacation. I went with her to the Locale of Balanga to attend the service. I went there and listened to the preaching. When I attended, even the songs alone already pierced my heart. Actually, even when we were just talking about it, I felt I already wanted to join. I had no more doubts. While in the locale, Sis. Katrina told me that there was an indoctrination schedule at the time. I asked, “What is that?” She said, “You can go downstairs and listen to it.” I did and they welcomed me warmly. When I listened, I cried. I received it; for me, it’s truth. So from that worship service, I continued all the way. One day, I wasn’t able to attend as I didn’t have any money for fare. I really have no money… Something unfortunate happened to me abroad. I didn’t have any fault, but something like that happened to me. I just found out one day that the place where I saved my money was empty. I didn’t expect that would happen to me. Now, I feel light, and I feel in my heart the teachings of Bro. Eli and Bro. Daniel. I hope that they could give me a job as I am having a difficult time. What I do for a living now is I clean in cemeteries; I maintain the grass around the sepulchers green. I hope that I will have a job that is different from being a housemate. I’m alone in my house; it’s a nipa hut. I hope that I will be given a job. If I will be able to return abroad, then no problem. I learned the right way to pray. Also, the woks in the Church, you’ll see that they are united in doing them. That’s what I really I liked about the Church, the unity. The brethren help each other. My family was given help by this Church, the Church of God International. We were helped through the Munting Pangarap [Small Wish, is a livelihood-granting program on UNTV]. We were given capital to start a small business. I learned about this on television, through listening to the Bible Expositions. I’ve heard about this since I was a kid. But my mind then was still on playing. However, when I was around 15 or 14, I’ve learned about the Church of God International. The words of God that I heard from the Bible Expositions on TV are what urged me to join. I heard on TV the teachings of Bro. Eli and saw his charities to people. And despite that there are defamations against him, he still continues to do good unto all. That’s what we need to do, to do good to others. I felt chills while I was in the water, and my whole body was trembling. I said “Amen” to all of the questions [of the baptizer]. I hope that they will be able to continue preaching the word of God unto all people. Through this, I was able to realize that people learning the word of God is important for people; it is our obligation. We are here on earth for us to do our worship to God and the Lord Jesus Christ. Read short testimonials of faith from some of MCGI’s youngest brethren on December 24, 2015 at the Ang Dating Daan Convention Center in Apalit, Pampanga. This is where I heard the words of God in the Bible. I had a friend in Quezon City who lead me here to eventually join the Church of God. He’s Bro. Domingo Cabido; he’s about nine years in the Church already. When I went there, I saw that I liked Bro. Eli’s preaching. So I continued from then on. I didn’t have any doubts anymore. As fate would have it, there was an indoctrination scheduled at the time, so I went straight to it. I am happy because I have finally done what I have yearned for all my life. May they continue the preaching that they do. It’s because of the teachings. That is what I followed here. I learned about this on TV, and I found that Bro. Eli’s teachings are better than those of other religions I have been in. I have been listening for a long time, about a year already. I have long been looking for this, but I have found it only now. It was at the Locale of Bagbag where I went to first, but then I found one that was near our place. Oh, it feels good. It really feels good inside. I felt such a relief. All I can say is, I became a believer because of those words that Bro. Eli and Bro. Daniel preached. To God be the glory. This is the right one. This is the truth. Oh, I’m so, so happy! It feels good; it’s inexplicable. 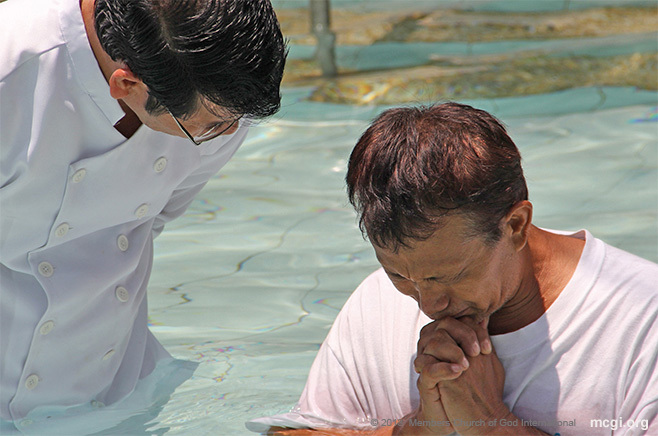 I also experienced being baptized in a Born Again group, but the feeling wasn’t like this. My head just got wet there. But here, I felt different. Also, even before the baptism rite, you will see that the doctrines are really something else already. I mean, the doctrines are great! No other religion has taught these. I’ve been to the INC, in the Born Again, in Catholicism; all of those groups, I’ve investigated their doctrines, but I found nothing. Our eldest brother has been here in the Church for 10 years now, Bro. Rene Cordova from the Locale of Nagcarlan, Laguna. Actually, we used to mock him. We are nine brethren and the eight of us would go against him. My father is a Catholic devotee, while one of my siblings is a Born Again devotee because she wed an American who is preacher, a pastor. We have different religions in our home. My other sister is an Iglesia ni Cristo member. We would debate with each other, but my brother already had wisdom. As our eldest, we respected him. But [after being baptized in the Church of God], when he spoke, it was like he was a different person. His views are now different. He doesn’t easily get angry. It’s just, he’s different now. Before, we thought it was just nothing. We thought he changed because he was just already old. My brother and I are close, him being the eldest and me being the youngest. We are always together, except when it comes to this. Now, before he left for Manila, my wife and I watched Bro. Eli’s program once on UNTV. Since then, we got addicted to it. We watched it daily. Our day would not be complete without us watching it. We would watch it after coming home from the office, and would do so until around 2 a.m. Then, the following morning, we would watch again. I pray always for him. I hope that he will be stronger, that he’ll have courage. We are just here, the brethren, to support him. We will not leave the gatherings [with God’s help]. I heard Bro. Eli’s teachings before. I was a Born Again Christian for 13 years. Now, I’m a seaman and my shipmate gave me copies of [Bible Exposition videos] from here in his hard drive. My shipmate is just one year here in the Church. He gave me topics of Bro. Eli and I listened to them daily in the afternoon after work. So I studied them until I went home in December and decided to attend the indoctrination, because the doctrines are truly based in the Bible. It feels light inside. I felt that all my heart aches, the ill feelings I kept before. I felt relieved. I hope that they will just continue their propagation of God’s words that many more will be lead unto the truth. My parents are members here for about ten years now. I found this to be the only religion that has these doctrines. I hope they will continue their works because they are good and may the Lord continue to keep them. I felt the true God here. I got interested the very first time I heard Bro. Eli. The things that I didn’t learn from my former religion, it’s here that I learned them. That’s why I got interested and joined. I once asked my boss about the difference of Catholicism with The Old Path. He told me to listen. There was a Mass Indoctrination at the time, so I attended it. Upon that first instance of listening to Bro. Eli, I learned about the things we did in Catholicism that were wrong. I felt glad about it. I was thinking twice before, but after I got baptized, the anxieties in my heart were gone. It’s like I don’t feel any pain. I felt relieved. I’m thankful because I got to know this religion. I hope that they will continue spreading the truth that many more souls will be saved come Judgment Day. Read short testimonials of faith from some of MCGI’s youngest brethren baptized on December 18, 2015 at the Ang Dating Daan Convention Center in Apalit, Pampanga. I learned here what we shouldn’t do. The things which we thought before to be right, were actually wrong. I learned other things as well that we should not do like evil works. I felt that I am now closer to God. I’ve long been listening, but it was only after four years since that I got baptized. I believe the teachings are right. Also, our lives were changed, because we know that we are in the right place to serve God. I felt light, like I have a new life before me to serve God. I hope that they will be able to continue leading many more people so that the wrongdoing of others will be set to right. This is where I saw the true word of God. I can see that what Bro. Eli is preaching is true. In other religions, while the truth is written in the Bible, they don’t teach it. It was only in November that I got to listen. I tried to attend the indoctrination sessions, and even on the first day of doing so, I felt the presence of God. It feels light because I feel cleansed of all my sins. Also, I feel like a new man. I hope that they will continue the good things they do to people, and I hope that they will be able to save many more souls. It’s good. I got to listen to Bro. Eli in Cabiao. Actually, I’ve long been listening but it’s only recently that I got to listen [in the indoctrination] for seven days. I felt relieved because of their teachings. I joined because ever since I heard Bro. Eli on TV and on the Internet in 2012, I knew in myself that what he says is true. Only, I still had vices and luxuries back then. However when I had a baby, that’s when I thought that my life should have direction. That’s the main reason why I joined. Actually, I haven’t been baptized in any religion; even in Catholicism, I wasn’t baptized as a baby. So this was really the first and I have nothing to compare it to. But I will say that it is only now that I have cried because of overflowing joy. May they take care of their health more that their lives will be longer, especially Bro. Eli, because they are able to lead many people back unto the Lord. Read short testimonials of faith from some of MCGI’s youngest brethren baptized on December 11, 2015 at the Ang Dating Daan Convention Center in Apalit, Pampanga. This was introduced to us by my elder brother. In the beginning, I just went with him because he was family. Actually, he accompanied us [him and members of his family] on the first day of the indoctrination. He didn’t come with us however the second time around. We were actually looking for him and was wondering why he didn’t accompany us anymore. So that time, we decided to go to the locale on our own anyway because our interest was piqued with what we had heard the first time. I first heard Bro. Eli in 2006, I think. I had affiliated myself with the INC, and I had heard about Bro. Eli then because they were bashing him so I got intrigued. I was there (INC) for three years but I didn’t get baptized. I couldn’t stand their doctrines. There was a part of the teachings where I wasn’t convinced. Perhaps another reason why I didn’t get baptized there was for me to have a chance to think that there is a true church outside them. In the past three years that I’ve been listening there, you could say that I have already memorized what they are saying. Perhaps God willed for me to not be baptized there so I could join another. When we were in line to be baptized, I was praying. I felt nervous and I didn’t know why. When the Church worker was already speaking, I was crying already. I don’t know why, but when I got immersed and then out of the water, I felt that I lost some weight. More power to them. I hope that I will get to see them, even just once. I hope that the propagation of the Gospel of God will grow wider. I pray that all the intents of their hearts come true. I had many wrongdoings before, and I want to change. I want to be saved when the time comes. It was my wife who always listened to Bro. Eli at first. She actually became a member ahead of me. Even when the baptism rite hasn’t started yet, I already felt nervous in my chair. Then, when the time came when I knelt in the water, I just felt my tears fall from my eyes. I hope that the Lord will give them longer lives that they may be able to continue the works they have started, and in turn, many more will return unto the Lord. I want my soul to be cleansed. It’s because of my aunt that I got to listen to Bro. Eli. Sometimes I would watch on television, but I started listening [religiously] last year. The doctrines are true and Bro. Eli preaches the truth. I feel okay. Somehow, I feel relieved inside. I hope that they will continue doing what they do. I also hope that they may last longer on earth, so that they can preach more the word of God. Because I believe in Bro. Eli’s doctrines. I was able to watch through UNTV since last year. His teachings are very clear, and he’s telling the truth. The doctrines are very unique and I believe that his doctrines are different, exceptional. It feels great. I felt like as if I were in the clouds. [Laughs] It’s like the Spirit is with you. They are gifts from God. I love them so much. Bro. Eli is life-like Jesus Christ. 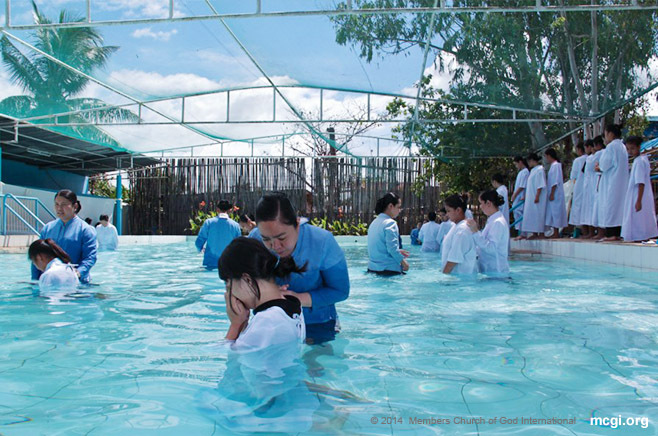 Read short testimonials of faith from some of MCGI’s youngest brethren baptized on December 4, 2015 at the Ang Dating Daan Convention Center in Apalit, Pampanga. It’s the teachings. I watch Bro. Eli on TV, and I saw the wrong teachings, things that Catholicism does. I’ve long been listening, but I have only listened intently and religiously for a few months now. It feels light inside, and I really felt like crying because I realized all of my sins. It really feels light because you feel like you have been truly washed. [I joined] to serve as an example as well to my parents. My papa was the one who invited me to listen to [Bro. 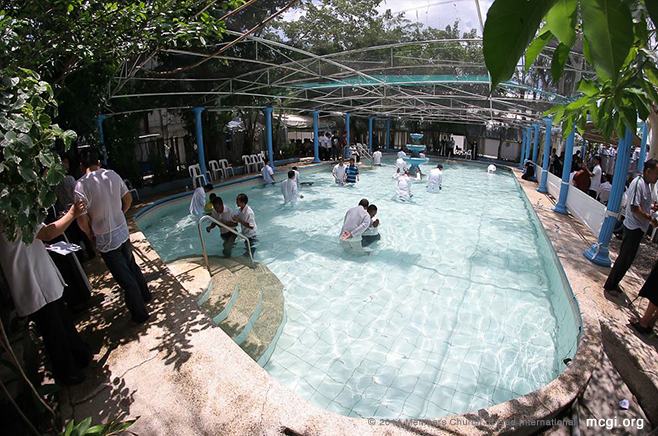 Eliseo], but I was the one to be first baptized here. Many thanks to the teachings that you teach. They preach the truth that they know. I know that this is the right one, that this is the truth. My papa was the first one to become a member, and my other siblings as well with God’s mercy. I have long been listening and I’ve actually been indoctrinated before but didn’t push through with baptism as there were still many temptations then. Now with God’s mercy, I was able to finish it. Actually, now I suffer from depression, and I feel like I’m still fighting it now. I still have questions in my mind, but I fight it. I feel light; I feel so light inside. To Bro. Eli and Bro. Daniel, I know that they are the true ones sent by God. They know the truth. I hope that they will live longer lives. I also hope that many more people will be able to listen to them for their hearts to be opened and their minds be aware that the coming of the Lord Jesus Christ is near. Just a little more time of waiting left, and everything will be all right. Bro. Miguel: Firstly, whenever I watch Bro. Eli I always hear from him the word “love”. When you have love of fellowmen, you keep in mind that what you do to your fellowmen, you also do to the Lord. Also, in every question asked him, he reads the Bible for answers. He doesn’t give his own interpretation, but it is the Bible that speaks. Sis. Rosanna: I feel in myself that my heart is content with the teachings because everything that Bro. Eli and Bro. Daniel say is in the Bible. Also, they explain it and I understand it well. I felt scared to not join because I discovered that worshipping idols is prohibited in the Bible. I was really a devout before in Catholicism, but when I knew that bowing down to graven images is wrong, it changed me; I found the truth here. Of course, I want to become close to God because He is the true God. Even though I didn’t see Him, and truth is, nobody has, but we believe in Him. And that is true love. Although you don’t see Him, you obey His great commandment of loving God above all. Bro. 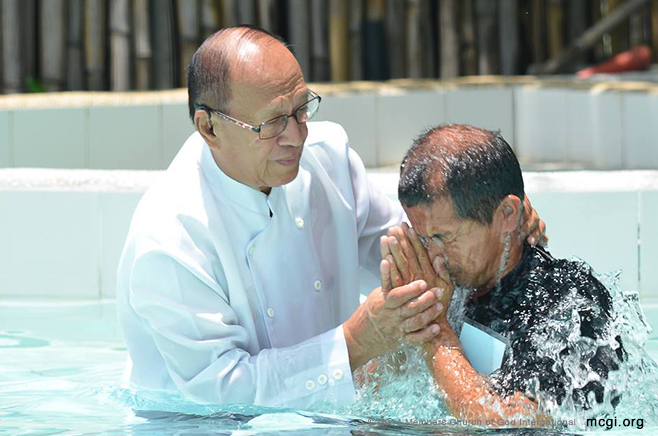 Miguel: Actually when I was being baptized, I felt that there was a bit of heat by my head. It was as if I was partly seeing the light of salvation. Sis. Rosanna: For me, I didn’t hesitate obeying because I was really scared of not being baptized. The truth is here and you feel that the teachings are really true. It feels good inside, like I felt cold and relieved. Bro. Miguel: For Bro. Eli, I hope that he be given good health, a longer life and above all, may he be able to help the brethren more. Sis. Rosanna: Many thanks for his perseverance in opening all to the true Christian faith. May Bro. Eli’s and Bro. Daniel’s lives be longer that they may be able to help more people like us. I started hearing from Bro. Eli the things about Catholicism and the idol-worship. I then wondered why people are bowing and worshipping graven images even though the latter cannot hear, speak, nor walk, as Bro. Eli said. That’s when I watched the television program and heard everything that Bro. Eli has to say. Time went by and I felt relieved whenever listening, and now I’m here, baptized; I didn’t want to delay it any further. I am happy. I feel light inside because I used to have many sins before. When I was in Catholicism, all kinds of vices were available, because there were no prohibitions. It’s only here through Bro. Eli that I heard what the Bible do not approve of. Also, thinking about it, it’s only here that I felt light, that my being became happy. I am glad, and my heart is content. Bro. Eli, if you are [reading] this, I am thankful for your patience in teaching all men to understand the word of God. I am thankful that I am one of those chosen by God to become a member. Please, be patient with us. May the Lord give you a longer live and heal you of all sickness. Read short testimonials of faith from some of MCGI’s youngest brethren baptized on November 27, 2015 at the Ang Dating Daan Convention Center in Apalit, Pampanga. I watch on television and listen to Bro. Eli daily. I felt as if he was the one who invited me to attend the Bible Exposition, and the Mass Indoctrination after that. I continued with it because it was good, and I felt relieved. I am so very happy. I feel as if my heart is oh so clean, like I don’t have any sins anymore. It’s a pleasant feeling. When I got immersed in the water, I was trembling and cried afterwards. Perhaps it’s the Spirit of God. Bro. Eli is a really good preacher. Everything he says is true; he doesn’t mingle it with word-mongering. What he says is in the Bible. So when someone asks him a question, it’s the Bible that answers. He won’t answer just any answer, and that’s what encouraged me. The teaching is good — I learn from it. Firstly, I knew God. Secondly, I learned the things that the Holy Spirit prohibits, which I didn’t learn from Catholicism. I just did whatever things I could and wanted to do. Now I ceased from drinking, smoking, gambling, and listening to rumors. Though we live near a squatter’s area, I refrain from all of those things. I’m wholeheartedly thankful that I became a member of The Old Path, of the Church of God. As I was researching about religion, the time came when I found Bro. Eli on television, on UNTV. I liked what I was hearing; it’s really from the Bible, and that became my basis. A person can just speak whatever he wants, so what matters is what he is speaking and where it is from. It’s mixed emotions, but I’m happy. What’s most delightful about it is that I know that I have finally obeyed what the Lord wants. Thank you Bro. Eli and Bro. Daniel, because if it weren’t for you, we would not be enlightened. Above all, I thank God. To God be all the praise and thanks for all that they do. You will truly believe that [what is preached here] are the teachings of God. Also, no one can refute what he [Bro. Eliseo] is saying. Now, I have a duty because when you’re not yet baptized, it’s like you are a non-bonafide participant. When you are a member already, it feels that your service is counted all the more. May the Lord keep you and may you be able to propagate the word of God more. Thanks be to God. I have long been listening to the teachings, and I feel that my conscience is urging me to join already. The pull of worldly acts is great outside the Church, and so to strengthen my faith more, I listened to the doctrines. It’s like having a duty in the Church as well as keeping the teachings in our hearts. Of course I feel blessed. Thanks be to God. I have repented of the sins I have done. I have a new life. Bro. Eli and Bro. Daniel, I hope that your lives will be longer. May He give you more strength every day. I hope that Bro. Eli will also be able to return here in the Philippines. Thanks be to God. I was invited by my boss to attend the indoctrination. After that, I went here. I liked the explanation of Bro. Eli. The teachings he preaches are really in the Bible. It’s only now that I’ve been baptized and my body feels light. Bro. Eli, I’m thankful that I met you as you are one of the servants of our Father God. Because of that, my boss was able to invite me to attend the indoctrination. Now, I’ve been baptized. I’m really glad with the many things that have happened in my life. Bro. Jose Buenaventura invited me to listen on television, on the Internet and on Youtube. And all I can say is that everything is based in the Bible. All I know is that it’s in the Bible, and I believe that that is what is true. I feet light. I’m actually focused what is said in the doctrines that I’m a new man, that I must not return to my evil works in the past. I saw this through television on UNTV Channel 37 and heard about it on radio via La Verdad 1350. Compared to other programs I’ve heard before, this is different. It’s the one that gave explanations on verses that are enough for me to be convinced and believe. Before, I have been baptized as well and was immersed in water, but I didn’t feel anything. However, I’ve been crying since baptism and I don’t know why. I can’t explain it. I’m happy to have experienced that. I’m thankful because they served as a bridge for me to know the Lord. Firstly, my thanks is to the Lord as I have long been searching for Him, and it’s only through the both of them that I found the Lord. I heard about this through my husband on radio and UNTV since long ago, about 2008. I have undergone indoctrination before, but I wasn’t able to finish it because of work. Perhaps, it wasn’t yet time. But with God’s mercy, He willed for me to be baptized now; my husband got baptized first. This is where I really found the true teachings of the Bible that we did not see in other religions. In Catholicism, the Bible is not taught as it is in here. So our minds were opened to things of the Lord. I feel happy and relieved inside. The feeling is just different knowing that my husband and I are now members of the Church of God. All I can say to Bro. Daniel is happy 32nd birthday. To the both of them, many thanks. I hope that you will have longer lives that many people’s minds will be opened about the Bible, and become members as well. Please continue this kind of work. May you have longer lives. In Catholicism, it’s different. Their take on the Bible is different. It’s like Catholicism doesn’t care what is written in the Bible, but just preaches what they want to preach. I’m happy. I have no problems actually. All I know is that I’m really enjoying finally being here. I know that this is the truth from the Bible. Of course I’m happy that I have found the righteous way in the Bible. Thanks be to God, because of them, I have learned the truth. Read short testimonials of faith from some of MCGI’s youngest brethren baptized on November 20, 2015 at the Ang Dating Daan Convention Center in Apalit, Pampanga. I saw the true teachings. They give the right teachings to us. There is nothing wrong with the teachings. I was actually just surfing the television channels one day and I found his [Bro. Eliseo] program. I was encouraged to join by his doctrines that he teaches. You cannot hear those in other religions. Though it was cold, I felt so happy. I felt that my sins have been cleansed. May they always be safe. I hope that the words of God be propagated more in the whole world that other people may know what we have learned. I have long been listening to Bro. Eli, since about 2001 if my memory serves me right. The doctrines are right. They don’t lack anything nor there is anything added. Just right. I feel okay. I feel I know all truth. I’m thankful because I’ve long been longing to join. Time came when I got assigned in Batangas. I searched for the locale there. But since it was far from where I worked, I decided to be baptized here. My father is an avid watcher of Bro. Eli’s program, The Old Path on television. As time went by, I got curious as well. He’s so amazing; he knows so much about the Bible. When we were in the Born Again, I knew many famed pastors and leaders, but none of them knows what Bro. Eli knows. They don’t have that intensity of understanding of the Bible, so I’m really so amazed by Bro. Eli. When we attended the Mass Indoctrination, I learned a lot. Summing it up in one word: eye-opening. It feels light inside. 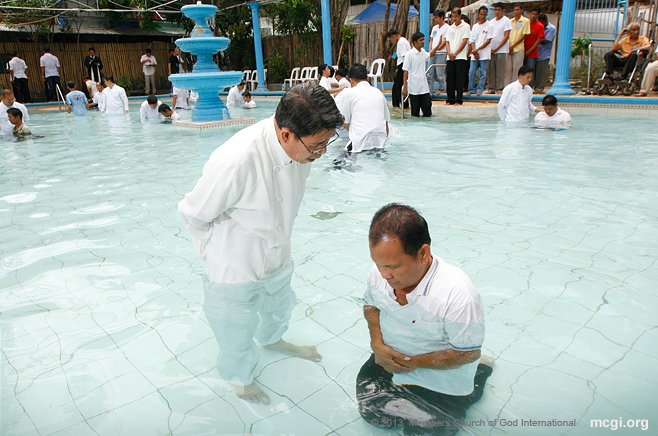 It’s my first time to be baptized, because when I was in the Born Again, they didn’t let me. And I’m glad that this is my first time, because it’s really legitimate. This is also my gift to myself before I turn 18. It’s God’s calling to me. First of all, they’re really good. I’m amazed by them because of their works. They don’t tire. They’re really a blessing to us. I’m glad that there are people like them who have such a great amount of love for God. Without limits, without boundaries, they share God’s words. I’ll always keep them in my prayers. It was my wife who really liked watching the program on television. She has been listening for about seven years now. As she listened nightly, I was also able to hear the preaching as well. Actually, I wasn’t interested at first as I was Catholic. But when I finally listened to it, I found that the teachings were right. Then, my wife decided on it: She asked me when I would join so that we would go at the same time. We searched for the locale in Makati, but we didn’t find it there so we went straight to Shaw Blvd. Actually, it was more convenient for us to be there. And now, we’re here. We are really thankful to God. I’m thankful for my wife as well for inviting me here. It feels so light inside, like all of my problems are gone. It’s an inexplicable feeling. I am hopeful that we will be able to endure until the end. Actually, I want to bring my children here now as well. Of course, we know the kind of help they extend to our fellowmen. I hope that many more souls will be saved, not only here in the Philippines but in other nations as well. Read short testimonials of faith from some of MCGI’s youngest brethren baptized on November 13, 2015 at the Ang Dating Daan Convention Center in Apalit, Pampanga. I have proven that what Bro. Eli says is true. It is only here where I saw all the truth that aren’t in others. The teachings here are different than with the religions I have heard. When I heard Bro. Eli’s preaching, all the questions that I had were being answered. I was amazed by him, because other religions didn’t have what he was doing. The righteousness as well that he speaks of is entirely from the Bible. I’m happy because I have finally done that which I have wished to do: To return unto the Lord. I hope that their lives will be longer and that they will be able to spread more the righteousness of God in all corners of the globe. May God the Father continue to guide them. Firstly, the teaching of Bro. Eli cannot be found in other religions. The wrongdoings of other religions, he corrects as well. Also, you’ll see that everything is right because it is in the Bible. That’s why I believe in what he says because he reads it from the Scriptures. At first, I didn’t mind the teachings so much. But as I kept on listening, I understood it and have learned many. I started having questions since then, which got answered as I continued watching the program. So now, I have no more questions because they have all been answered by Bro. Eli. I was crying when I got baptized. As Bro. Eli said, you must repent of the things you have done, and I got to think of all the sins I’ve committed. It was emotional. Of course, I wish Bro. Eli and Bro. Daniel more strength. I hope that nothing bad will come to them abroad. It’s because they are able to propagate the truth. May God the Father bless them more. I didn’t have any idea about this before. But my husband and his family have known about this for quite some time now. So when they attended the Bible Exposition, I went with them. It was all new to me, but I was able to adjust quickly as the people are kind. My husband had also just been baptized today, but he, like his brother, has long been listening to Bro. Eli. Whenever they would turn the TV on and tune in to Bro. Eli, I was able to listen as well. It felt light inside, like it’s a new you, like you have a new life. I hope that they will continue helping our fellowmen that they may be able to bring other souls to God. I hope that this organization will continue to flourish as well. May they have more health for them to be able to do what they need to do. I found that the teachings, the doctrines are really from the Bible. I have been listening for about 10 years now, but my brother has been doing so through television since childhood. So we felt excited when we got to the locale as we have been wanting to go for a long time. Actually, we had seen the locale already before. One time when we went to the town of Sto. Tomas, our ride dropped as off right by the Ang Dating Daan Coordinating Center there. My brother then said, “Perhaps, it’s the Lord’s calling already for us to try and go in.” We then tried attending the indoctrination, and it went on from there. The feeling was so light and really different. I felt that I had a new life and that all my worries and anger are gone. It’s like you were born again, problem-free. May they continue their work of encouraging souls unto salvation as there are many people now who are lost because of false doctrines. So we are happy that we have finally found the true teachings that are from the Bible. I believe that what Bro. Eli preaches is good and true. Before I have attended in Biñan thrice, when my friend invited me. However, when he went to the province I wasn’t able to attend. My friend works as a housemate in a place near my work. Whenever I was on-duty, he would bring me to the locale. I’ve actually been in a Born Again group, but I didn’t like their manner of things, so I left. Of course, you must go where the truth is. It was a pleasant feeling. It’s as if I cannot remember anything else like ill feelings and problems. I hope that they will always be strong. I wish that their bodies will always be healthy. Because once their gone, nobody will lead us. Read short testimonials of faith from some of MCGI’s youngest brethren baptized on November 6, 2015 at the Ang Dating Daan Convention Center in Apalit, Pampanga. For the longest time that my husband has been bringing me to the locale, I get to hear the teachings of God. My husband never forced me to become a member, as I don’t want that, because I want to feel that it is God who is calling me. Then, there came a time that whenever I would hear that the time is coming, I would feel afraid because I didn’t want to be left out. That’s when I realized that perhaps the Lord was calling me already. I asked the Lord that He give me wisdom that I would be able to fully accept in my heart. And I felt that. My husband has been bringing me to Church services since 10 years ago. [Laughs] At first it was just to Worship Services, but lately, also to Thanksgivings. Whenever he turned on the television, I would hear Bro. Eli as well. Actually, I didn’t know then that he was a member already during that time. He started reading the Bible at home then, and he would bring me and our children to Church services. I think he’s 15 years in the Church already, certainly, more than 10 years. Before, it was only him who attended, and he would just bring us occasionally. But since two years ago, he was very consistent in bringing us to services. I felt so happy. I mean, even in just the congregational singing, I really couldn’t explain what I was feeling already. I just felt my tears falling. Even until now I feel like crying because of so much joy. I hope that the Lord will give them longer lives. May He will it that they may be able to propagate the good news, that many of our fellowmen will be saved like me. This is where I saw the true teaching that I did not hear from any other. I have fancied listening to religious groups of all sorts, but it is only here where I heard and understood the teachings that others fail to teach. I was a Catholic before. Then, I became a member of the Mormon Church. I also attended the services of the Iglesia ni Cristo [INC], and the El Shaddai group. There have indeed been many already. My mother and father started listening in 1997. I started listening then as well. I had immediate interest the first time I heard the teachings. It feels good whenever I hear his [Bro. Eliseo] his words. So whenever they would listen again, I really liked joining them. This time, I wanted to change already. I have forced myself to change for many times now. I told myself that I can do it on my own. But I’ve tried it, and I just can’t. I cannot explain it. All I know is that I’m happy. Honestly, I feel can now carry all the problems that I couldn’t bear before. I hope that they will be able to lead many more people. I know that this the right one. There’s nothing wrong with the doctrines, that’s why I didn’t have any doubts in joining. My father is already a member, and he has been bringing me to Church services since I was little. He also always watched on television. The first time I completed the indoctrination, I felt that I wasn’t yet ready. There was something in me that still weighed things, even when it came to the seventh and eighth sessions. But then in the last one, I thought that I really should already, because there is nothing you can say of the doctrines as they are all true. I felt happy. It was a different feeling. I hope that they will still be with us for a longer time that they may be able to help us more through teaching us. I hope that we can overcome trials. I started out as an atheist. All of my family are Christians. It seems I couldn’t feel anything; I was out of place. The time came when my mom was urging me to go with them in the indoctrination sessions. We would fight because I refused her invitation then. However, when they had finished it and got baptized, I decided to get indoctrinated as well. The first time I attended the indoctrination, I just went there as if I didn’t have any choice. I didn’t have any plans. I don’t know what happened. I was sitting there listening to the teachings, and I couldn’t believe how I could be in such a place where I really felt the presence of God. For quite some years, I didn’t acknowledge God, like he didn’t exist. But never did I imagine that in only a few days of listening that would be changed. I felt so light, because before I felt so heavy. I used to think of attempting suicide. I didn’t know what to do with my life. I felt empty then, as if I didn’t have any purpose. I just went to school and went home on a day-to-day basis, and it felt like I had nothing more. However, when I was baptized, I felt that I then had purpose. I now know for whom I live. I’m thankful for them because they have been used as instruments in propagating the word of God.